SANTERAMO IN COLLE, Italy – Italian leather upholstery and home furnishings resource Natuzzi reported third-quarter 2018 consolidated net sales of $105 million, a decline of 3.2% from the comparable period last year. The accounting for Natuzzi’s $44.4 million in net income for the period ended Sept. 30 included extraordinary third-quarter income of $59.5 million from the finalization of Natuzzi’s partnership agreement with Kuka in July. The company reported a third-quarter operating loss of $8.2 million, compared with a $9.7 million operating loss for the same period in 2017, when it had a net loss of $12.4 million. Through the first nine months of 2018, Natuzzi’s consolidated net sales for the first nine months 2018 were down 2.9% from the same point last year to $360.8 million. Under constant exchange rates, sales would have been $375.3 million, or up 1%. Upholstery net sales decreased by 5.2% through the third quarter, partially offset by a 27% increase in furnishings sales, which now represent 24.1% of Natuzzi Italia net sales. Natuzzi also announced that its board of directors has resolved to adopt International Financial Reporting Standards (IFRS) for its consolidated financial statements from the fiscal year ending Dec. 31 in place of the Italian Generally Accepted Accounting Principles (ITA-GAAP) currently adopted. Through 2018’s first nine months, Natuzzi division sales of $257.7 million, which include Natuzzi Italia, Natuzzi Editions and Divani & Divani by Natuzzi, were flat compared with the same point last year. Natuzzi Italia net sales increased by 9.5%, compared with the first three quarters of 2017, and represent 34.8% of the entire Natuzzi Group’s core business. 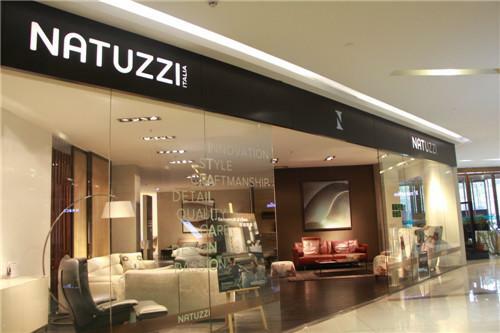 Following the execution of the partnership with Kuka in China, the 11 Natuzzi Edition directly operated stores were transferred and, consequently, are no longer considered in retail division numbers. During the first nine months of 2018, direct retail division net sales rose 19% over the prior-year to $45.7 million, with same-store sales up 4.5%. Natuzzi reported positive sales numbers in the United States (up 47.1%), Spain (up 11.2%) and Switzerland (up 6.5%). Sales in Italy fell 1.9% due to more promotional sales in third quarter. United Kingdom-based retail sales declined 22.1% mainly due to the rationalization activity still in progress in that region. Recently opened U.S. Natuzzi Italia stores in Chicago; Costa Mesa, Calif.; King of Prussia, Pa.; and West Palm Beach, Fla., reached the break-even in the third quarter. Today, 76 directly operated stores include 38 Natuzzi Italia, 18 Divani&Divani by Natuzzi and 20 Natuzzi Italia concessions. Wholesale division sales fell 3.3% through third-quarter 2018 to $212.1 million. Sales in the Softaly low-end segment were down 11.2% through nine months to $80.3 million, with a 7 % increase in the Asia-Pacific region, a 2.4% decrease in the Europe/Middle East/Africa region and a 24.4% decrease in the Americas. Since Softaly faces increasing pressure on prices, Natuzzi is reconsidering its approach to that business segment. Natuzzi Chairman and CEO Pasquale Natuzzi noted that the company’s unbranded business continues to suffer. He added that discussions surrounding the application of tariffs on home furnishing products manufactured in China for the U.S. markets generate uncertainty. He concluded that October and November have seen improvements in supply chain efficiency, and the company expects better sales and results moving forward. “These improvements must continue in 2019 where we will focus on supply chain efficiency improvement, enhancement of retail and wholesale business profitability along with a tight control of costs,” Natuzzi said.